A winterized fence is a fence that can hold up to winter weather while still enhancing your curb appeal. As the summer ends, and fall begins to creep in, it’s time to start thinking about protecting your fence from the upcoming winter weather. 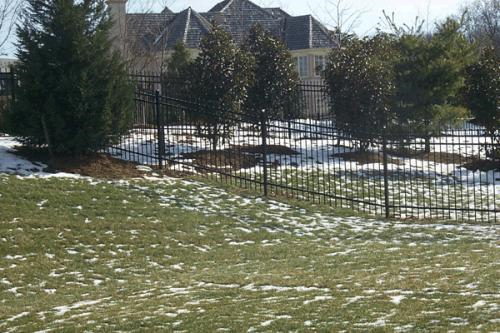 A winterized fence is a fence that can hold up to winter weather while still enhancing your curb appeal. Begin by inspecting your wooden fence for any damage that may have happened during the summer. This includes insect damage, dry rot, shifted posts, and missing rails or pickets. A damaged fence can be a liability and a security hazard. If you find that your fence has already been invaded by insects or dry rot, call a professional to help repair the damage. They will remove the damaged section out and replace the section that was removed with the same type of wood that was used in the original fence. Re-sanding, priming, and painting or staining the entire fence can be an arduous process, but it will prevent you from having to replace the entire fence down the line. Aluminum fences require very little maintenance, but can benefit from a pre-winter inspection. If the powder-coating has worn off in any areas, the fence will need to be sealed and repainted before winter weather causes the metal to rust. Ornamental steel or wrought iron fencing needs frequent maintenance to maintain that classy, stylish look. Keep an eye out for rust, as that means the fence likely needs to be repainted. Professionals will remove the rust with a stiff metal brush, and then wash the fence thoroughly, before priming and painting with a rust-proof paint. This entry was posted on Friday, September 11th, 2015 at 8:59 pm. Both comments and pings are currently closed.